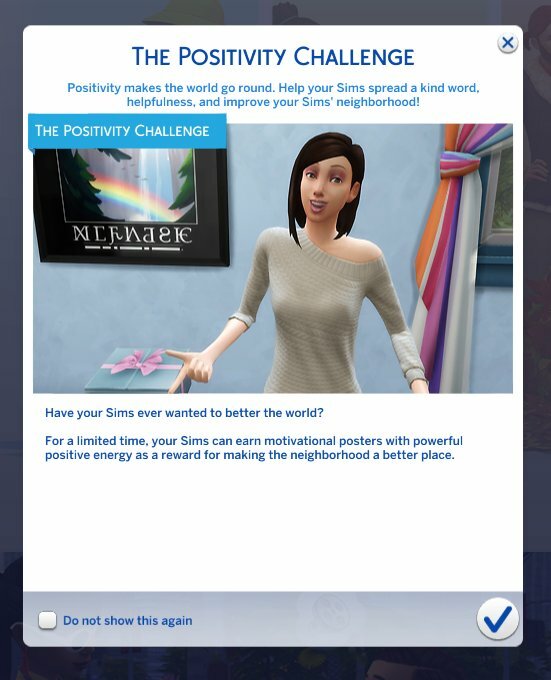 The Sims 4 Positivity Challenge Is Now Live! Millie Bobby Brown has arrived in The Sims world to challenge your Sims to complete the Positivity Challenge! This limited time event is active right now, but won’t be around forever… You have until December 4th, 2018 to participate. Simply use your Sim’s phone to call the Event Coordinator (surprise, it’s Millie Bobby Brown), and she’ll provide everything you need to start making your Sim’s neighbourhood a better place for everyone. Good Luck Simmers and let’s get these rewards that this challenge brings. The Sims 4 Get Famous as seen on the screenshot was provided by EA. Where can I find the posters? Are they in personal inventory/household/ where are they?